While virtually every company uses software to support operations, many applications only support the functions of a specific process. As a result, companies implement a variety of software packages that don’t integrate with each other. With no collaboration supported among operations, employees find themselves duplicating work and manually re-entering data gathered from other departments that slow down business. Enterprise Resource Planning (ERP) systems offer a suite of integrated software packages that support business processes across the company. Based on a common database, ERP software integrates core enterprise functions and workflows such as order entry, production, and finance for increased efficiency, transparency and accountability of information. With information gained from an ERP, companies can better understand workflows, customers and suppliers to optimize the business. 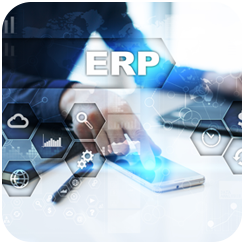 To be truly effective, an ERP solution must integrate all business operations as well as interface with customer and supplier systems. Questa Technology can help you plan and implement a new best-in-breed ERP solution with the right collection of business software modules built around your business operations. Understanding that operations differ among companies, especially in various industries, we work with top ERP vendors including Microsoft, Oracle and SAP in delivering software structured to meet your specific requirements. In addition to new migrations, our range of services includes ERP system upgrades, product maintenance, support, new integrations and reporting. Using Microsoft Dynamics NAV, we can build an ideal ERP solution for small to mid-sized organizations as well as companies with various divisions that connects vertical business functions to automate operations and provide greater visibility into workflows. Oracle ERP applications can serve as the infrastructure in managing finances, procurement, products and projects on an enterprise-wide basis. Whether you are looking for an Oracle developer or an Oracle database administrator, Questa Technology has the IT professionals for your project. With processes focused on human capital management, Oracle PeopleSoft delivers best-in-class human resource functionality including workforce management, talent management and workforce service. We can help you architect a global foundation for HR data management and improved business processes using PeopleSoft as the foundation. Questa Technology can help you gain more control and visibility into your global operations by implementing applications from the Oracle E-Business Suite. With applications that manage customer relationships, procurement, service, supply chain and more, our IT specialists can build a solution that includes the right tools so you can better manage the complexities of your global business environment to make sound decisions, lower costs, increase performance and become more competitive. Using the Seibel Customer Relationship Management (CRM) Applications, our ERP specialists deliver end-to-end customer lifecycle solutions that help you manage all customer-facing operations including sales, marketing, commerce, service and even social. Supporting multiple business processes critical to financial operations including financial management, project management, order management, asset lifecycle management and manufacturing, JD Edwards EntepriseOne and JD Edwards World can serve as your financial foundation in streamlining operations and improving the accuracy of reporting for greater compliance, reduced risk, and long-term planning. Tools are even available for use on smartphones and tablets. As different companies prefer specific technologies, Questa Technology supports SAP ERP applications that manage customer relationships, financial, human capital management, product lifecycles, and supply chains. With our knowledge of SAP technology, our IT team can support end-to-end business processes for companies of all sizes across all industries. Using our services, we can help you leverage the right SAP applications to streamline your processes across procurement, manufacturing, service, sales, finance, and HR.